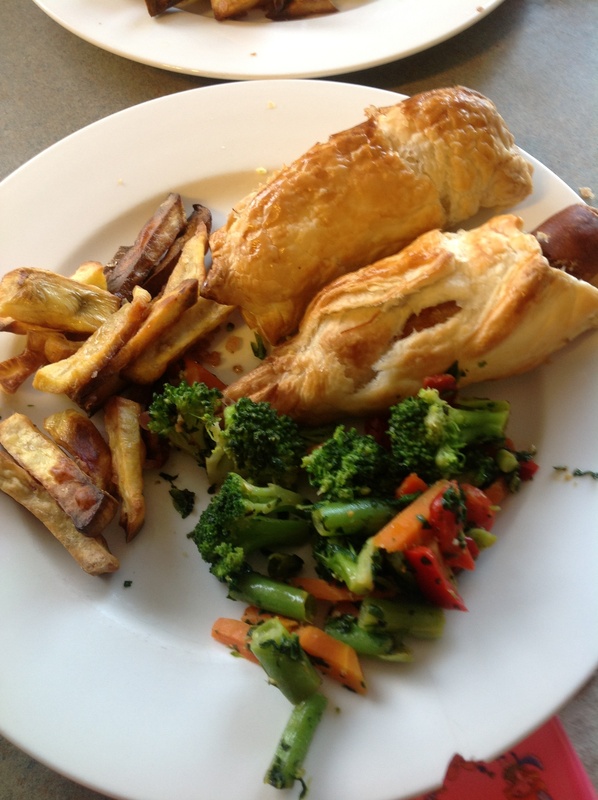 Day #22 – Sausages-In-Pastry & Kumara Fries | Have kids, they said. It'll be fun, they said. Well, gosh. Today I skipped a vital step and it completely ruined my entire plan. MY ENTIRE PLAN. See, I was going to cook Toad-in-the-hole. Sausages in batter, yum. A favourite from my childhood. So confident was I that we had the ingredients, I thought hey, I’ll photograph them after I make the batter. No. Just, no. Fail, Mrs T. Because, as luck would have it, after I had mixed in the flour and the soy milk, I realised that this is what I had in my egg carton. 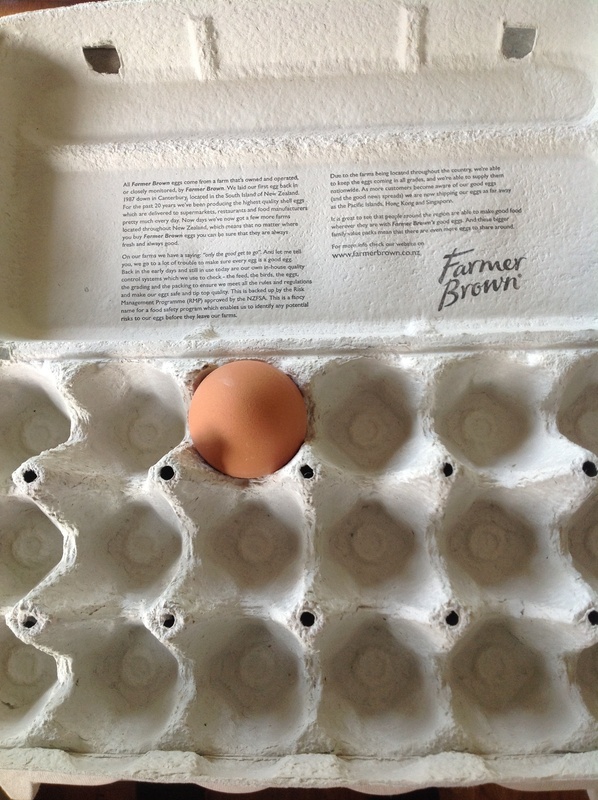 1 egg. 1 measly egg. No worries, I thought, I can go and get more. No. Just, no. Fail, Mrs T. Because, as luck would have it, BabyGirl has decided that now is a great time for her to sleep. Not last night, mind. Not this morning. Now. So, going out to get the eggs wasn’t an option. Sigh. Back to the drawing board, I thought, as I sadly disposed of my little eggless batter. Mr T has been at work all day today with no food, so he told me in a phone call that he was Very Hungry. He was looking forward to dinner, he couldn’t wait. I needed something quick, something with minimal ingredients and something tasty and filling. Voila. 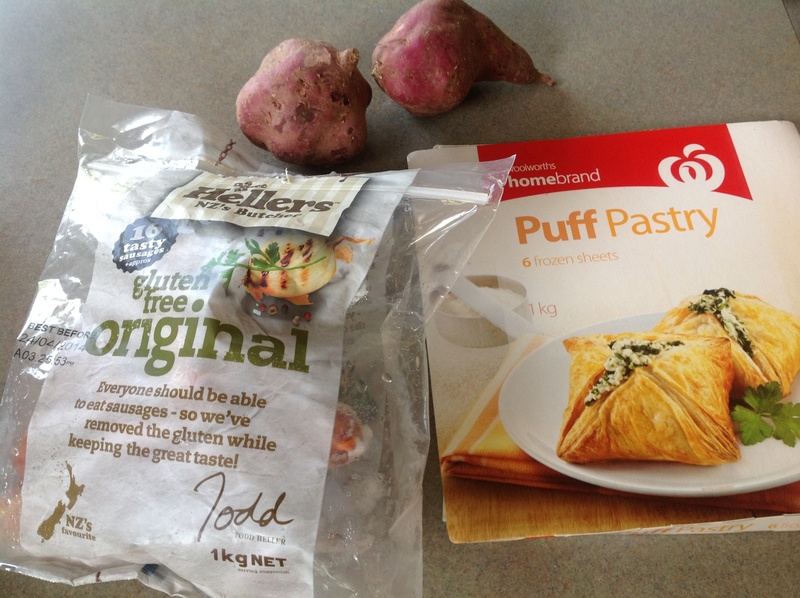 Sausages in Pastry (aka Easy Sausage Rolls) & Kumara Fries (oven baked). I should say, many Kumara (or, Sweet Potato) chip recipes seem to be laden with sugar. For me, the Kumara is sweet enough as it is, so I tried cooking them without the need for any seasoning aside from salt. I would have used pepper as well had BoyChild not destroyed my pepper mill and hidden the part required to fix it. Sigh. Wrap the sausages in pastry and then brush with whisked egg. Bake until sausages are cooked and pastry is brown and crispy. Peel the kumara and slice into nice chunky-chip-sized pieces. Place in an oven tray and coat with oil and salt. Assemble in the tray so the chips are on a single layer. Bake until they are crispy and crunchy. I served this meal with veges that I stir fried with garlic and I have to say, these Sausages in Pastry were pretty fantastic. It’s hard to get BoyChild to sit at the table, let alone eat a meal but tonight, he did. He pulled the sausage out of the pastry and ate that, then wolfed back the pastry. He loved it, and so did the girls. Lucky that I made 9 of these because both BoyChild and Princess asked for more. Mr T was pretty satisfied too, a nice meal for him to walk in to after work. More than a win tonight, this meal blew the other meals out of the playing field! Funny post. You can’t go wrong with sausages and pastry, big crowd pleasers in our house anyway!